Uzun, T. (2014). Learning styles of independent learning centre users. Studies in Self-Access Learning Journal, 5(3), 246-264. Learning style research has been a significant field within language teaching and learning. There have been very few attempts, however, to seek possible links between independent learning and learning style preferences. This paper aims to identify the learning styles of students who use the Independent Learning Centre (ILC) on a regular basis at a state university in Turkey (n=102). The findings of the learning style analysis revealed that, contrary to expectations, most of the regular users of the centre were synoptic learners, which implies that these learners might not necessarily have conscious control over their own learning processes. An in-depth analysis of learning styles and recommendations to improve the services offered in the centre are also included in the paper. Autonomy and independent learning have been two key concepts in teaching and learning settings for the last few decades. Benson (2011) notes that autonomy, or the capacity to take charge of one’s own learning, could be seen as a natural product of self-directed learning, or learning in which the objectives, progress and evaluation of learning are determined by the learners themselves. Independent learning, on the other hand, is associated with a number of different terms such as ‘self-regulated learning’ all of which describe very similar themes including students having an understanding of their learning, being motivated to take responsibility of their learning and working with teachers to structure their learning environment (Meyer, Haywood, Sachdev, & Faraday, 2008). However, skills like setting learning goals, monitoring the progress, evaluating the learning gains and taking the responsibility of one’s own learning might turn out to be challenging tasks for many language learners without support and guidance. Institutions can provide self-access centres (also commonly referred to as independent learning centres) to assist learners in reaching these goals. Dofs and Hobbs (2011) point out that by setting up self-access centres and/or incorporating self-study time into the curriculum, institutions can (1) provide self-study situations, (2) teach transferable skills for independent studies, (3) actively encourage learners to use their innate aptitude to learn, (4) create opportunities for learners to take accountability for their own learning, and (5) let learners take control of their own learning as much as possible. A self-access centre can be defined as a purpose-designed facility in which learning resources such as audio, video and computer workstations, audiotapes, videotapes and DVDs, computer software and print materials, access to the internet or satellite TV are made directly available to learners (Benson, 2011). Once inside the centre (or hooked up to a computer), learners will decide what work to do, find the right kind of material and activities and settle down to complete the learning task (Harmer, 2007). In a learning area facility which aims to provide its users with different types of materials and promote independent learning, it seems significant for the administrators of self-access centres to gather data on their users’ profiles and needs. They should seek ways to find out the basic individual characteristics of their visitors along with their needs in each particular centre. Learning styles are one of those individual characteristics which could play a significant role in learning and teaching processes. A learning style is defined as the preference or predisposition of an individual to perceive and process information in a particular way or combination of ways (Sarasin, 1999). They can also be considered as convenient shortcuts for talking about patterns of what an individual is likely to prefer as a learner (Leaver, Ehrman, & Skekhtman, 2005). It appears that every learner has a learning style, consisting of a unique blend of instructional and environmental preferences, of information processing preferences, and of preferences related to personality; no one style which typifies good language learners has been identified yet (Nel, 2008). The role of learning styles within the fields of language teaching and learning has been a matter of interest in literature. Rusli and Soegiarto (2001), for instance, maintain that the difference in cognitive learning styles needs to be taken into serious consideration as one of the factors toward a successful student’s learning autonomously. The findings in their research revealed that cognitive learning style, namely field independent and field dependent does not have any effect on the achievements of students in History (subject matter); on the other hand, it has an effect on English (subject matter). In another study carried out with non-English majors in a Chinese university, Wang (2007) found that participants varied in their preference for particular learning styles. According to the researcher, the varied and uneven distribution of learning styles among learners implies that it is important for teachers to be aware of the feature of learning style preference among learners and to respond flexibly by employing a broad range of teaching strategies to better reach students of different learning preferences. Similarly, according to Karthigeyan and Nirmala (2013), it would be useful for teachers to know the learning styles of their students so as to offer individualized instruction and for students to plan and make better use of their study time and learning strategies which can improve their academic performance. a) Learning style preferences are measured with subjective judgments, which could affect the validity and reliability of the statistical analyses. b) Test items in some of the instruments are ambiguous or problematic as they ignore the socio-economic, geographical and cultural contexts of learners. c) Some of the leading tests have been commercialized. d) No direct link has been established between variance in learning styles and achievement outcomes. e) Some of the conclusions made after highly elaborate statistical treatments are relatively simple and sometimes exaggerated. Pashler, McDaniel, Rohrer, & Bjork (2008) also underline that there is no adequate evidence base to justify incorporating learning styles assessments into general educational practice. According to the researchers, given the lack of methodologically sound studies, it would be an error to conclude that all possible versions of learning styles have been tested and found wanting. Additionally, Kruse (2009) points out that students do not possess learning styles; rather every student has unique prior knowledge, experiences and developmental levels. 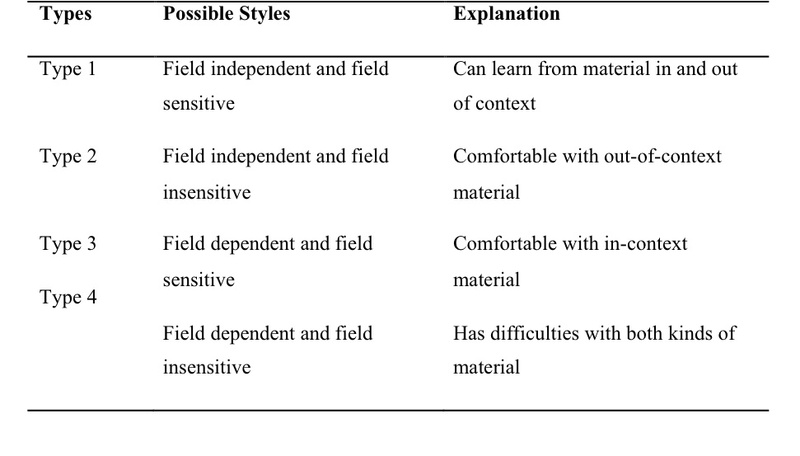 The role of learning styles in teaching and learning has recently been challenged within the literature; however, learning style preferences could still be helpful in determining learner profiles. With this study, it was aimed to reach the learning styles of regular users of the Independent Learning Centre and look into possible connections between independent learning and learning styles. It is important to note that the centre where this research was conducted is called an Independent Learning Centre; however, the centre functions in the same way as Self-Access Centres do. From this point on, the centre will be referred to as the Independent Learning Centre or the ILC. Yıldırım Beyazıt University is a state university in Ankara, Turkey. 100% English-medium instruction is offered in most of its departments. In order to equip students with necessary skills in the English language, the School of Foreign Languages leads a CEFR-based curriculum in which students receive 20-25 hours of English classes per week depending on their level. One facility based at the school is the Independent Learning Centre (ILC). Located in the School of Foreign Languages, the ILC aims to assist the students enrolled in the programme by offering computer-based learning materials, free internet access and a library section which contains books on language skills, grammar, vocabulary, exam preparation as well as readers and coursebooks printed by various publishers. The centre is equipped with 40 computers in two laboratories. Besides these, students can also study individually or in groups within the centre as some tables and chairs have also been placed inside. It serves students on weekdays between 09:30 and 16:30. Students are welcome to visit the centre voluntarily; their visits are not graded. The most common three reasons for visiting the centre were found to be ‘to do homework’, ‘to improve my English’ and ‘to prepare for exams’. The most useful materials for students were ‘listening materials’, ‘Internet links’ and ‘printed reference books (grammar, vocabulary, exam preparation etc.)’. The top three needs suggested by students were ‘more study space/computers’, ‘listening materials’ and ‘more guidance’ (Uzun, 2014). The ILC today provides students with extracurricular speaking and movie club activities supported with integrated language practice as well as workshops which, in general, aim to offer additional language-based and study skill activities. It should be noted that such activities were not offered to students during 2012-2013 academic year, when the study was conducted. Do the findings regarding the learning styles of regular users of the ILC reveal any signs suggesting that they could be independent learners? How can the services provided in the ILC be developed considering the learning styles of its users? The study was carried out with 102 English preparatory class students (out of 144) who were studying English in different levels. These students were found to be regular users of the ILC. 52% of them were male and 42% female. These students were supposed to finish their studies in English and take the proficiency test, which is held 4 times a year at school. Those who pass the test successfully complete the preparatory class and start taking departmental courses in their faculties. This study was conducted at the beginning of spring term in the 2012-2013 academic year. Data were collected with two instruments; Independent Learning Centre (ILC) Evaluation Survey and the Ehrman and Leaver (2002) Learning Style Questionnaire v. 2.0. The Independent Learning Centre (ILC) Evaluation Survey was developed in order to collect data about how the centre is used by students. It also functioned as a tool to determine the frequency of users visiting the centre. The survey was handed out in all the available classes and 715 students who were studying English in different levels in the School of Foreign Languages were asked to fill the questionnaire in during class time. The analyses of this first survey revealed that 144 students described themselves as regular users of the centre, placing themselves as visiting the centre between 1 or 2 times to more than 5 times a week. The detailed findings for this survey are presented in Uzun (2014). The questionnaire developed by Ehrman, Leaver and Skekhtman (2002) is an instrument of the E&L Model of cognitive styles construct. The instrument is referred to as the E&L Questionnaire in the literature. It is comprised of 30 items each of which includes two sentences on two poles. Learners are asked to place their learning attitudes somewhere between two poles from 1 to 9. The balance point is represented with number 5 and as students gets closer to each pole in their preferences, it means that they favour that item more and the opposite less. The E&L Model consists of a superordinate construct, synopsis-ectasis and ten subscales (Ehrman & Leaver, 2003, p. 395). According to Ortega (2009), synopsis refers to the preference to rely on holistic, at-a-glance perception of information and synoptic learners usually thrive with subconscious learning approaches because they prefer learning intuitively; on the other hand, ectasis refers to the preference to rely on detail and systems while processing new information and ectenic learners thrive when they can exercise conscious control over their learning as they are methodical learners. According to Leaver et al. (2005), the E&L Model originated from dissatisfaction with existing approaches to cognitive scales, which were leading to misdiagnoses and confusion about the meanings of terms. Ehrman and Leaver (2003) point out that they developed the questionnaire to make the theory operational and it was used at Foreign Services Institute in the USA as a tool offered to participants in the Learning Consultation Service. Field independence in foreign language is regarded as the ability to select something of importance or interest to focus while field dependence is considered as the absence of field independence (Leaver et al., 2005). Field sensitive learners use the full language environment for comprehension and learning while, on the other hand, field insensitive learners pay attention to a particular language element being studied rather than focussing on the whole language environment (Leaver et al., 2005). As a learning style subscale, levelling-sharpening difference represents what learners pay attention to and how they store it in memory (Ehrman & Leaver, 2003). Levellers remove distinctions instinctively and they frequently see similarities; sharpeners, on the other hand, look for distinctions among items (Leaver et al., 2005). Global processing focusses on the ‘big picture’ and processes “top down” whereas particular processing attend to discrete items and details and process “bottom up” (Ehrman & Leaver, 2003). Impulsive learners think and respond nearly simultaneously, which means that they tend to complete their work more quickly but often with less accuracy; reflective learners, however, think, then respond, which in turn results in their accuracy in their work but their slowness sometimes means that work is incomplete (Leaver et al., 2005). Synthetic learners like to use pieces to build new wholes while analytic learners like to disassemble wholes into parts (Ehrman & Leaver, 2003). Digital learners take a more surface approach than analogue learners dealing with what they can see or hear directly; analogue learners, on the other hand, gravitate to the use of metaphors, analogies and conceptual links among units and their meanings (Leaver et al., 2005). While abstract learners show a preference for grammar rules, systems, discussion of abstract topics and attention to accuracy, concrete learners prefer sensory contact with what is being learned, a relationship with direct experience, and experiential learning (Ehrman & Leaver, 2003). Sequential learners generally prefer to receive materials that have been organized in some fashion as in syllabuses, lesson plans or programmed tutorials; on the other hand, random learners generally prefer to develop their own approach to language learning and organize assignments in their own way, often without an apparent order (Leaver et al., 2005). Inductive learners form hypotheses and test them; deductive learners, however, prefer to study the rules, and then practice applying them to examples (Ehrman & Leaver, 2003). The E&L Model (2002) was adopted for this research for a number of reasons. First of all, it was considered that a learning style questionnaire which solely focusses on language learning would be a more appropriate option; therefore, some alternatives which aim to find more general learning style preferences were discarded. The second reason for selecting this particular model among the remaining options was that it contains items that can be connected to independent learning including the main distinction in the model, synopsis and ectasis. This factor played a significant role as the learning style analysis would be carried out with the regular users of the ILC and it was aimed to seek possible connections between independent learning tendencies and learning styles. Another important reason for the selection of this particular model and its instrument was that it was in use as an instrument for the Learning Consultation Service at Foreign Services Institute. Rather than a model which basically remains more like a theoretical framework, a questionnaire which is used in a real environment was regarded as a more practical choice. Once this questionnaire was selected, Betty Lou Leaver, one of the owners of this model and the questionnaire, was contacted via e-mail and permission was granted to use the instrument for this research. Considering the challenges while collecting the data, it should be noted that reaching the students one by one and asking them to participate in the research was time-consuming. As students were in different classes having their English lessons at different times of the day, the implementation process lasted longer than expected since it took time to find each and every student separately. Some students were reached during their visits to the ILC. Another challenge was about the style of the questionnaire. It was observed that some students were puzzled about how to mark their answers on the sheets. The bi-polar fashion adopted in the questionnaire seemed different and a bit confusing at first; nevertheless, they were able to complete the questionnaire easily with further support provided by the researcher. The E&L Questionnaire was then completed by 102 students out of 144. A raffle was held after the research was over and some gifts were presented to some of the participants later on. No feedback of confusion or a lack of understanding was reported while the questionnaire was being answered. Students were given the chance to ask for individual feedback on their learning styles. Individual learning style analyses were done upon request and results were sent to each participant by e-mail. The feedback document was also included some introductory and explanatory information about how to interpret the results. A learning style analysis will normally provide teachers or researchers with data for each individual separately. However, in this study, students’ answers to the learning style questionnaire were analysed in a collective manner in order to find out more about the overall learning preferences and tendencies of the regular users of the Independent Learning Centre (n=102). Both the overall learning tendencies and each subscale were also studied separately and comparatively. Data collected through the learning style questionnaire were analysed descriptively. Ehrman et al. (2002) provide a scoring key to interpret the results. 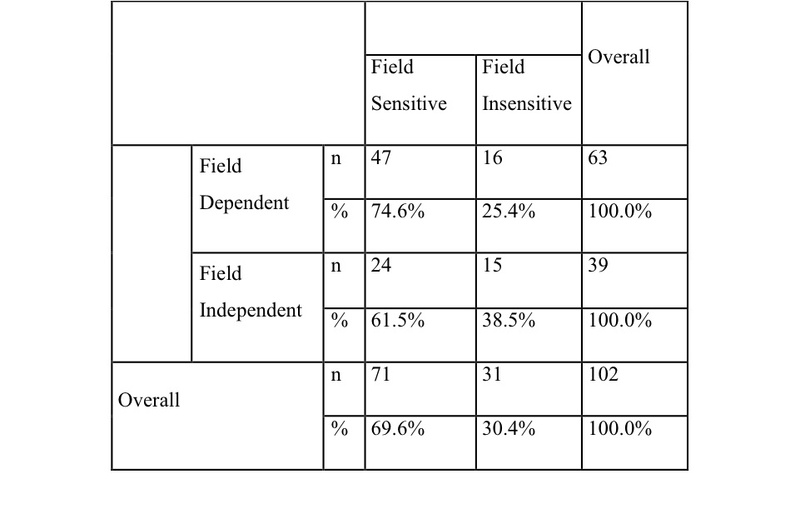 For instance, totals from questions 1, 11, 21 have to be added; students with a score of 1-15 are labelled as field dependent (ectenic pole) and 16-30 as field independent (synoptic pole). This scoring system goes in the same pattern in which the scores of 2-12-22, 3-13-23 and others refer to a single learning style. When the analyses were completed, each student had 10 labels for subscales and the dominance of the learning styles in either pole determined the overall tendencies of the participants as either synopsis or ectasis. Students with 5 learning styles in each pole were considered as ‘balanced’. This study was mainly based on descriptive analyses; however, chi-square tests were also applied to find out whether it was possible to reach possible correlations between some of the learning styles or scales which could somehow be related. 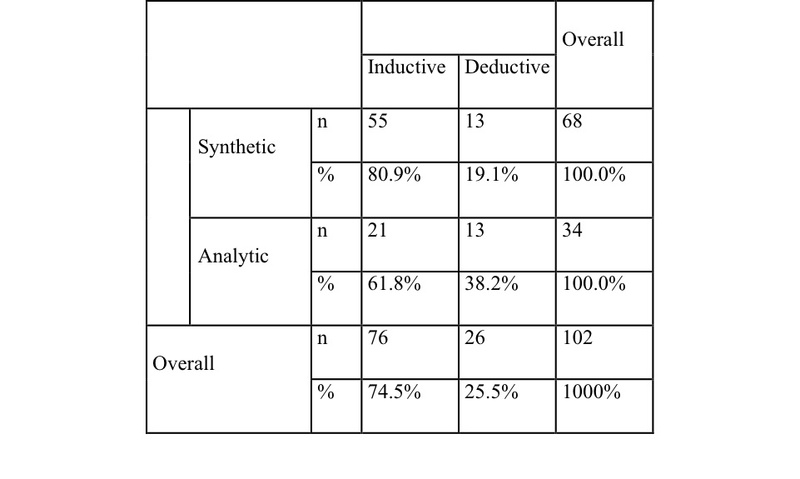 As shown in Table 2, analyses for the overall learning preferences revealed that most of the users were synoptic learners. Participants were found to be the learners who tend to rely on their intuitions and subconscious processing most commonly, as explained by Leaver et al. (2005). It is clear in Table 3 that some of the subscales received particular density. Dominant learning styles as well as the results of the correlational analyses will be handled in different sections below. Field dependence and field sensitivity seem to be two dominant learning styles among regular users of the centre. 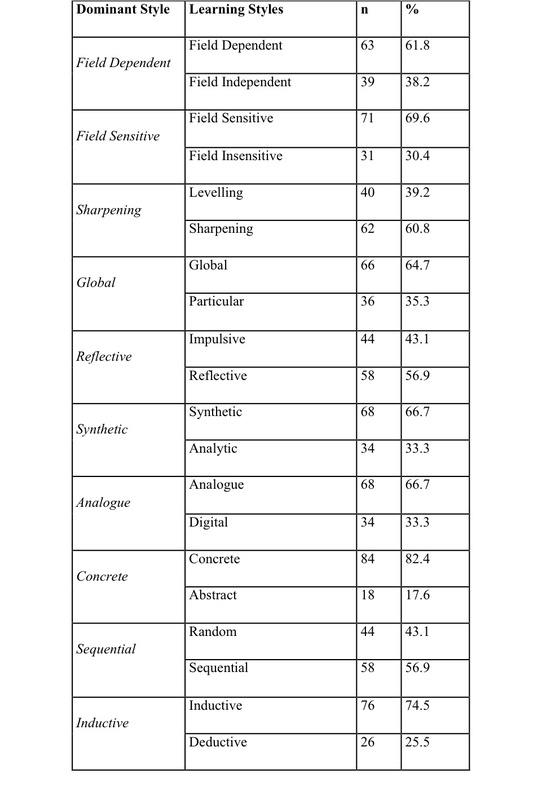 However, these two related subscales needed to be subjected to a correlational analysis as Ehrman and Leaver (2003) underlined four possible types (as cited from Ehrman, 1996, 1997) of learners as to how they make use of context in learning (See Table 4). According to the results of the chi-square test employed, no meaningful relationship was discovered between the first and the second subscale. However, it is clear that the highest correlation exists between field dependent and field sensitive learners (Type 3), which means that these users tend to make use of context for their learning. It is also possible to maintain that learners who can deal with out-of-context studies are also common considering the number of students who are both field independent and field sensitive (Type 1). According to Leaver et al. (2005), sharpeners generally notice and remember subtle differences of form and meaning which characterize native-like language depending on the level of language aptitude or previous learning experiences. Thus, it can be assumed that sharpeners will be successful in pronunciation, grammar and vocabulary studies as they could make use of contrastive analyses while working on these language areas. Additionally, these learners can also be good at studying individually in a more learning-oriented environment. The results obtained from chi-square test indicate that there is a meaningful relationship between general synoptic-ectenic learning tendencies and levelling-sharpening learning style subscale (p<0.05). 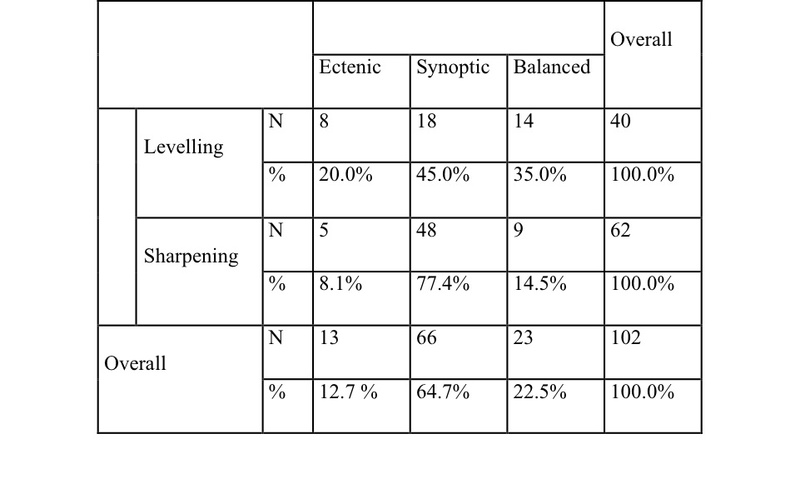 77.4% (48 students) of sharpeners were found to be on the synoptic pole. These results imply that the number of synoptic sharpeners who are expected to be successful in learning English is high. The results were found to be quite close in the impulsive-reflective subscale, which basically focusses on the speed of processing a response to a stimulus, or a speed and accuracy of language studies, as mentioned by Ehrman and Leaver (2003) and Leaver et al. (2005). More participants, though by a narrow margin, were reflective learners who are relatively slow, but at the same time who tend to consider accuracy important. If these learners overcome their problem with speed, they might be more successful in their studies, particularly in receptive skills as well as grammar and vocabulary. Besides this, they might find it hard to improve their productive and communicative language skills if they focus on accuracy too much in their production. Synthesizers assemble something new (knowledge, models, stories, etc.) from known information; they do this by using the given pieces to build new wholes such as making up new words, using typical roots and prefixes or rewriting a paragraph from a different point of view, using the sentences given as models (Leaver et al., 2005). On the other hand, inductive learners form hypotheses and then test them; they may rarely seek teacher support (Leaver et al., 2005). These learners could be considered similar in the way that they both prefer moving from parts to the whole. Seeing that synthetic and inductive learners are high in number, it was necessary to analyse correlations between each other. As can be seen below in Table 7, the ILC users adopting synthetic and inductive learning styles at the same time constitute an 80% majority. Although the analysis did not reveal a meaningful relationship, the density of these users seemed worth considering. The findings obtained in this study clearly show that analogue learners are dominant among the regular users of the centre. As pointed out by Leaver et al. (2005), analogue learners tend to prefer using learning material in meaningful contexts. This tendency seems to be consistent with common tendencies of field dependence and field sensitivity and imply that they are generally good at studying in-context resources. In this research, the highest number of students was found to have the concrete learning style. 84 students (82.4%) seemed to adopt the concrete learning style. Concrete learners are defined by Leaver et al. (2005) as those who are more hands-on and experiential learners with their preference to use real materials and examples for learning. Therefore, most of the users of the centre seem to favour the productive side of learning rather than dealing with more conceptual and abstract points. Learning style analyses were conducted with the regular users of an Independent Learning Centre in Turkish Higher Education context to find out more about the learning profiles of this specific target group. The aim was mainly to see whether the regular users of the centre showed any tendencies for independent learning by tapping into their learning style preferences. The results of the study indicated, contrary to initial expectations, that most of the regular users were not necessarily the learners who had conscious control over their learning. Although they showed some potential to lead independent studies successfully, regarding them as naturally autonomous or independent learners only because they use the Independent Learning Centre would not be a valid proposition. This result brought about the necessity to train the learners as individuals who can take the responsibility for their own learning. Building upon the findings of this study, the coordinators of the school have been currently working on an ILC-based learning advisory service and a learner training programme. Some initial steps have been taken in order to create an awareness among students. One of them is to provide ILC Workshops that are generally held inside the centre. The workshops so far have been based on learning strategies and various skills in learning. Additionally, a bi-monthly newsletter will be made available from the new academic year onwards. As well as the news about the activities taking place in the centre, students will be provided with texts that will address issues like study skills, learning strategies, ways to increase motivation and decrease the level of anxiety, useful tips for skills development and so on. The newsletter is also expected to be an addition to the study skills presentations, which are brought to all the classrooms by their teachers every week regardless of the levels of the students. All of these steps will form the elements of a more comprehensive and systematic learner training programme in the near future. Another result that could be drawn from the analyses carried out is related to users’ learning attitudes which revealed inferences about positive learning behaviour. For instance, synoptic sharpeners, who were found to be dominant, tend to reach the required professional levels of language proficiency with greater success than other students as suggested by Ehrman and Leaver (2003). The density of synthetic and inductive students was also considered significant. If adopted together, these two learning styles could refer to learners who are more interested in searching for knowledge and going from pieces to the whole. These tendencies in learning can also be regarded as favourable for independent learning and the ILC context. However, these learners might need more printed, computer and internet-based resources. In order to support them, ILC Worksheets on grammar, vocabulary and reading have been prepared and will be ready for use from the 2014-2015 academic year onwards. The general disposition not to seek a teacher in learning could be considered another positive behaviour in the Independent Learning Centre context. With more guidance for learning strategies and further steps, these learners could become more autonomous learners. The number of concrete learners indicates that most of them are interested in creativity and experimentation in language learning. This perspective can aid the activities to be prepared within the ILC; however, these activities could be more beneficial if they are designed in a way to promote concrete language use in communicative and real-life contexts. ILC Speaking Club activities have been initiated at the centre to enable the users of the ILC to practice English within communicative contexts. At the ILC, native instructors of English lead speaking activities in which they focus primarily on real-life language use and the ways to support students’ speaking skills. One other point that learning style analysis put forth was that context seemed to play a significant role in learning for a large number of students. Context needs to be taken into consideration while preparing learning materials and decorating the physical environment. More context-based learning materials in four language skills need to be incorporated to the printed and computer-based materials archives. It should be noted that the learning style tendencies were discovered among the regular users of Yıldırım Beyazıt University Independent Learning Centre in Turkey. These results can not only be used as an aid for future steps to be taken for the services offered by this centre, but they can also shed light on the efforts paid by similar learning centres established with the purpose of fostering independent learning. Tarik Uzun is an Instructor of English and Coordinator of the Independent Learning Centre at Yıldırım Beyazıt University School of Foreign Languages in Ankara, Turkey. He has been teaching English and Turkish (as a foreign language). He is currently a PhD candidate at Ankara University Department of Linguistics Foreign Language Education Programme. His research interests are learner autonomy, self-access learning, phonetics, lexicology and Turkish Language Teaching. The author would like to thank Assist. Prof. Dr. Sila Ay from Ankara University for her invaluable support and guidance throughout this research. Benson, P. (2011). Teaching and researching autonomy. Harlow, UK: Pearson. Coffield, F., Moseley, D., Hall, E., & Ecclestone, K. (2004). Learning styles and pedagogy in post-16 learning: A systematic and critical review. London, UK: The Learning and Skills Research Centre and Department for Education and Skills. Harmer, J. (2007). The practice of English language teaching (fourth edition). Essex, UK: Pearson Longman. Kruse, J. (2009). That’s not my style: Myths about learning and teaching. IOWA Science Teachers Journal, 36(1), 1-3. Leaver, B. L., Ehrman, M., & Skekhtman, B. (2005). Achieving success in second language acquisition. Cambridge, UK: Cambridge University Press. Nel, C. (2008). Learning style and good language learners. In C. Griffiths (Ed.) Lessons from good language learners (pp. 49-60.). New York, NY: Cambridge University Press. Ortega, L. (2009). Understanding second language acquisition. London, UK: Hodder Education. Sarasin, L. C. (1999). Learning style perspectives: Impact in the classroom. Madison, NY: Atwood Publishing.